Have you ever played a game of competitive sport when you’re sick? Then you’ll know you simply can’t compete at your best (except if you’re cricketer Dean Jones. Then you’d score 210 while violently ill during a test match in India in 1986 – legend). 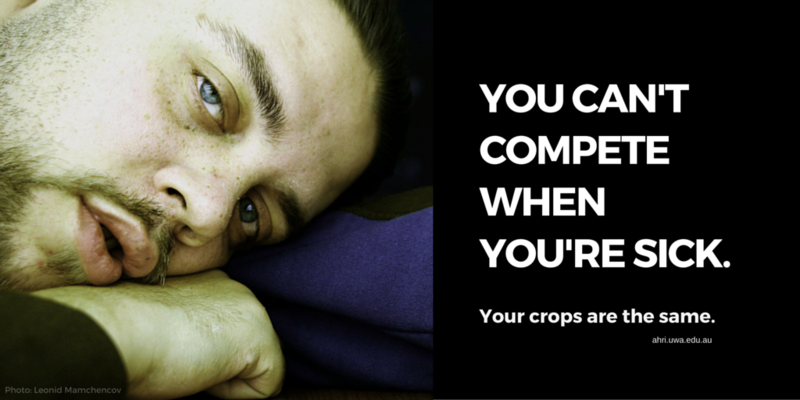 Crops growing in unhealthy soil can’t compete with weeds. To make matters worse, the unhealthy soil doesn’t seem to affect the weeds as much as it affects the crop. This makes a lot of sense, but there’s been limited research data to support this assumption. 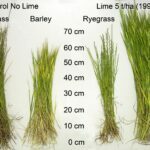 Acid soil is fine if you want to grow ryegrass, but you need healthy soil if you want to grow a crop! Is annual ryegrass and wild radish more acid tolerant than our crops? Anecdotally we would all say yes, but there is surprisingly little data on the acid tolerance of weeds. If both crops and weeds suffered equally in acid soil, then soil acidity would have little impact on the weed seed bank. 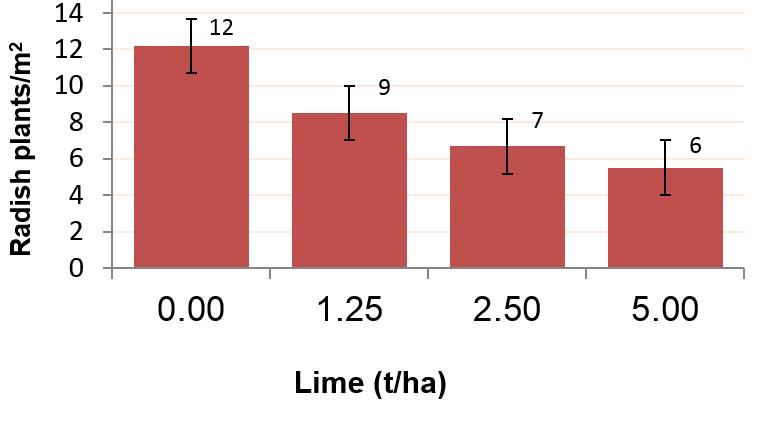 Lime trials by the Department of Agriculture and Food of Western Australia (DAFWA) give a clear indication that our crops suffer more than our weeds do in acid soil, and that this has considerable long term implications. Trial 1: Kelleberrin WA. Chris Gazey, DAFWA & Precision Soiltech, funded by Caring for Country. The starting pH in 1991 was 4.8 in the surface and 4.5 in the 10–20 cm layer. Limesand of 90% neutralising value applied at 0, 1, 2.5 & 5 t/ha in 1991. Whole site received additional 1 t/ha limesand in 2000. 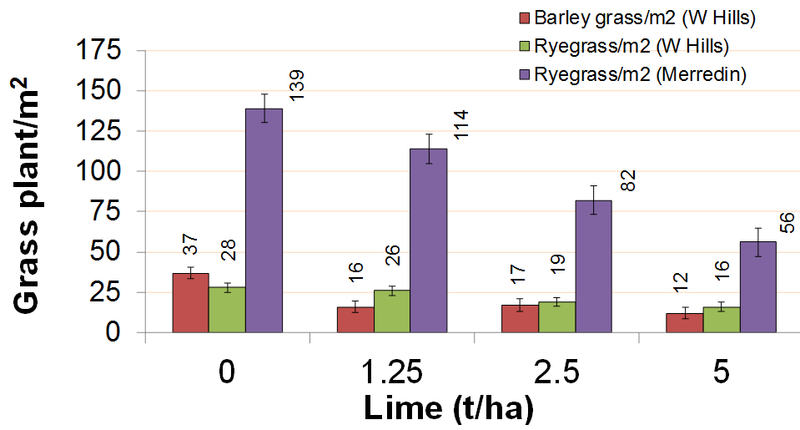 Many years of more competitive crops growing on the 2.5 and 5 t/ha lime treatments has suppressed the ryegrass seed set resulting in a lower ryegrass seed bank. 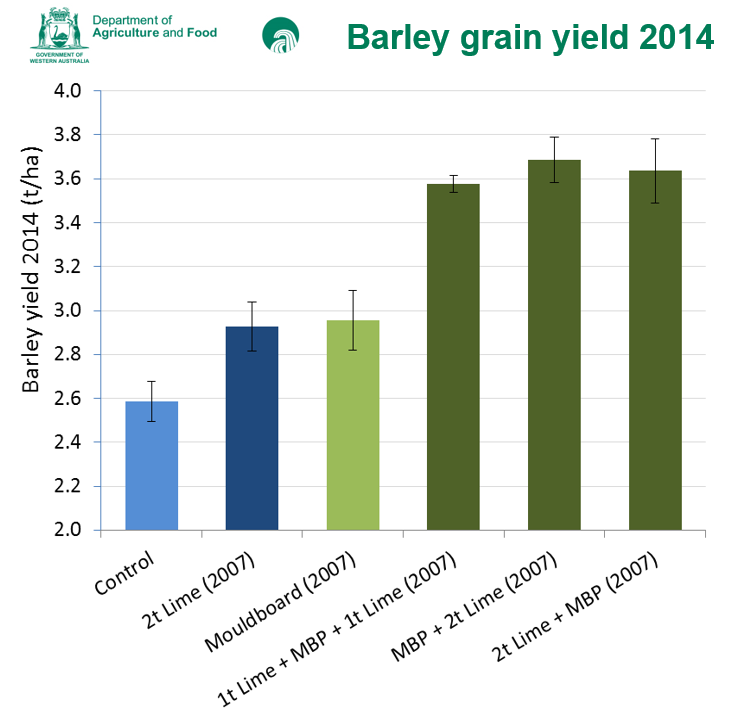 Barley is very sensitive to acid soil. Trial 2: Casurina, WA. Dr. Steve Davies, DAFWA (and Peter Newman). GRDC funded. This trial was set up in 2007 to investigate the incorporation of limesand with a mouldboard plough. 2014 represents the eighth crop since the trial was established and it’s still getting amazing results. Yield response to mouldboard plus lime was immediate. Soil pH testing in 2014 revealed that surface applied lime (nil mouldboard) had made its way into the sub-soil. The graph above says it all. 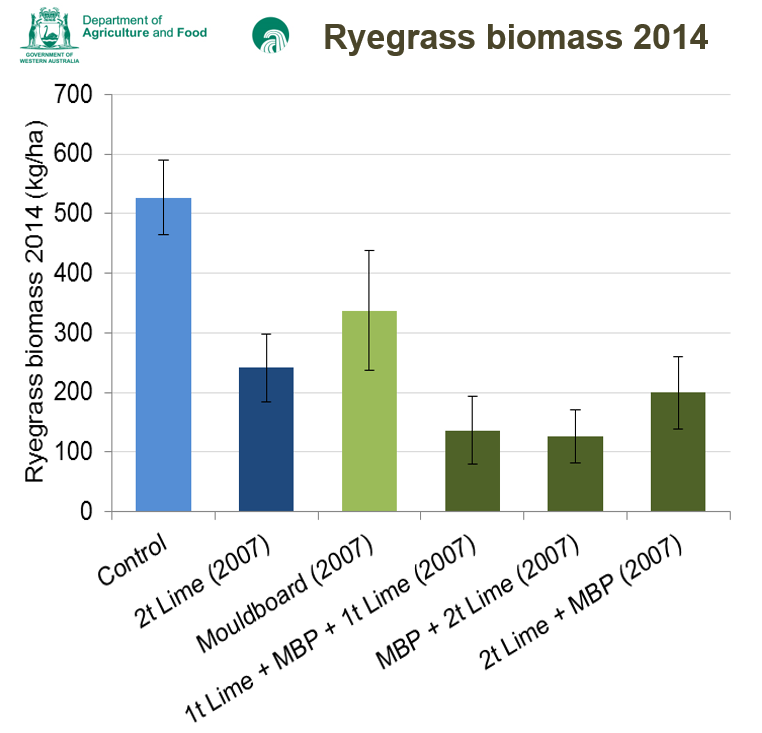 Wherever lime was applied, the ryegrass biomass in 2014 was significantly reduced. Mouldboard ploughing (MBP) on its own improved the soil and buried weeds (which also reduced ryegrass biomass), but it doesn’t compare to the mouldboard plus lime treatments. In 2014 the soil pH of the control was 5.1 in the top-soil and 4.3 in the sub-soil. These treatments also improved barely yield as shown in the graph below. Trial 3: Eradu, WA. Dr. Abul Hashem, DAFWA. GRDC funded. This trial was established in 2010 to investigate the effect of soil pH on wild radish. 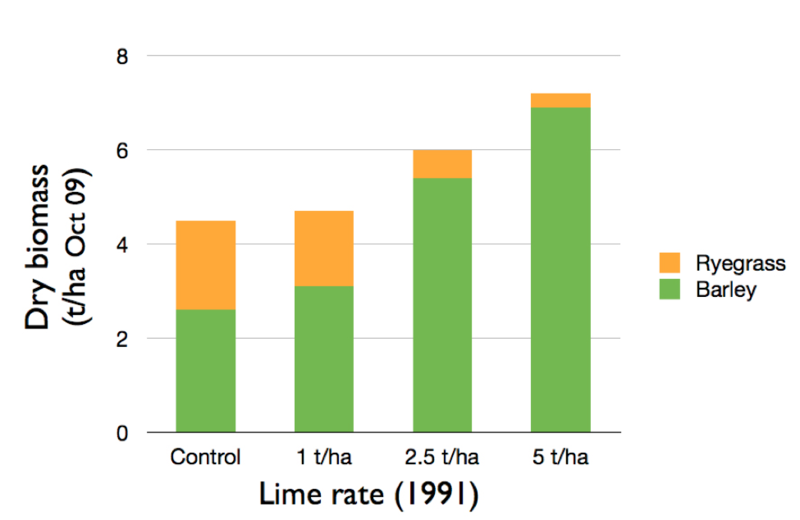 The graph below shows wild radish density in 2014 after lime treatments were applied in 2010. Control plot soil pH was 5.0 in the top-soil and 4.3 in the sub-soil. The graph below is from the nil post-emergent herbicide treatment over the four years of the trial. Interestingly, a similar trend was observed where Velocity® was applied to the three cereal crops in this rotation. Previous research has shown that wild radish grows better in acid soil than alkaline. Perhaps wild radish germination is also influenced by soil pH. Trials 4 & 5: Wongan Hills & Merredin, WA. Dr. Abul Hashem, DAFWA. GRDC funded. Ok, you get the picture. 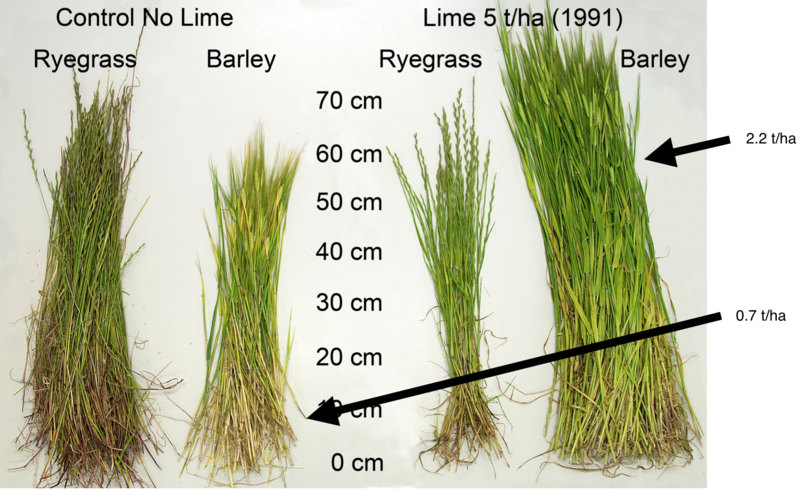 More data of the effect of lime on ryegrass and barley grass. The Wongan Hills site is very acidic with pH 4.7 in the top-soil and 4.2 in the sub-soil. We had to wait a while for these results because limesand takes years to dissolve and reach the sub-soil where the most acid layer often is. The data was well worth the wait and a big thank you to Chris Gazey, Steve Davies and Abul Hashem from DAFWA for sharing their data. It’s likely that the weeds do suffer from acid soil, but it seems that our crops suffer more. Fixing soil acidity is not the answer to all of our herbicide resistance problems, but crop competition is a vital tool in a weed management plan, and our crops cannot compete when the soil is sick. Competitive crops lose less yield from weeds, and weeds set less seed. Healthy soil, healthy crops, less weeds. P.S. We’re showcasing the Ryegrass Integrated Management (RIM) model. Find out what RIM can do with our easy-to-digest, done-for-you output from RIM. It only takes a couple of minutes! Follow the link below or click here.